On Monday 5 March, Year 8 embarked on a four day camp at the Somerset Outdoor Learning Centre in Colo. Despite some light rainfall during the first two nights, this was hardly a hindrance for the boys who accepted the new challenges presented to them with open arms. 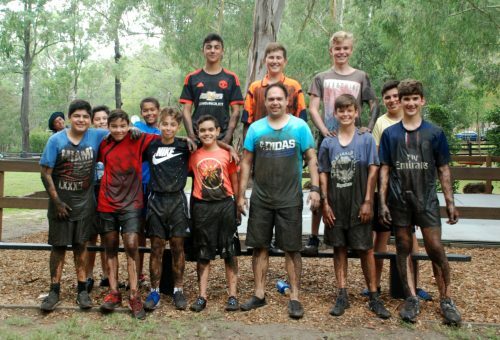 Camp Somerset offers a wide range of activities such as Bush Walking, Rock Climbing, High Ropes, Low Ropes, Canoeing and Donuting. These activities not only tested the ability of the boys to work together and communicate as a team, but also tested their patience and comradery. In addition to the physical activities, boys were also given the responsibility of cooking their own lunch and dinner and cleaning up afterwards. Some menu favourites included the picnic lunch, Sherwood burgers in the dining hall, wood fire pizzas, campsite nachos, BBQ snags, damper and marshmallows by the campfire. Year 8 students are to be congratulated on the way they conducted themselves over the four days, embracing every opportunity and challenge afforded to them. They willingly participated in activities which not only tested their personal comfort levels, but allowed them to grow and learn to work with other students whom they may not necessarily associate with at school.